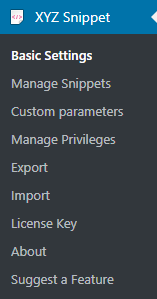 The settings for the XYZ WP Insert Code Snippet (Premium) are given below. The basic settings of the plugin are given below. Sorting of Snippets – We can sort the snippets based on create time or name with ascending order or descending order. Credit link to author – We can enable or disable the credit link to the author in the footer of the site here. Pagination Limit – This is the no. of items displayed in a page. If this value is 20, it will show 20 items in a page. Auto Insert PHP Opening Tags – It will insert the php opening tag automatically on enabling this feature.